You can design your own cards or crafts with smaller clip art frames, OR print this fun frame as a full sheet printable letter paper in Adobe PDF format - the choice is yours. Use the small pirate border image at left to make fun stamps and stickers with skull and bones borders. Just add photos and print. Print larger skull and bones border frames on card stock to make invites, picture frames, greeting cards. Print on parchment paper to add to a scrapbook or make a fun and piratey poster! Full Size (8.5x11 inches) pirate frame sheet. Each Adobe PDF note paper sheet prints 1 full-sheet letter size page on a single page. Click here to print a full size pirate frame border sheet. Use the larger pirate skull and bones border graphic (left) to design your own party invites, table cards, labels or small scrapbook picture frames. 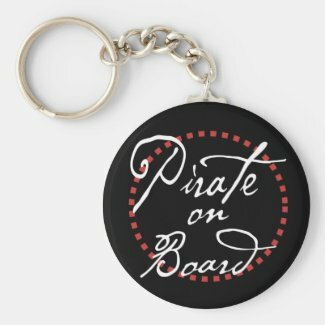 Matching pirates border clip art in horizontal or vertical strips also available for this pirate border design.